Italian Greyhounds are not generally known as the most biddable breed of dog and training can prove to be quite a challenge, particularly for new dog owners. Italian Greyhounds are sensitive dogs and do not respond to being treated harshly. We recommend that you use positive reinforcement training techniques such as clicker training where the dog is rewarded for good behaviour not punished for getting something wrong. And it is never too late to start, even with an older dog. Your vet may be able to recommend a good training class, or speak to other dog owners in your local area. House training Italian Greyhounds can be tricky. Some are a dream and others can be more trying. You need to be prepared for the worst if you are thinking of bringing an Italian Greyhound into your home. There is lots of different advice on how to house train a dog. One method is simply to never let your dog pee or poop inside. This is a labour intensive training method as it means that you have to anticipate when your dog might need to potty and then send them outside but it is generally worth it if you are able to carry it through! A dog usually needs to potty on waking up (whether from a night’s sleep or an afternoon nap), when he/she has just eaten, and after he/she has done anything ‘exciting’ like a play session. As you get to know your dog you will also be able to anticipate better when he /she may need to pop outside! Training an Italian Greyhound to be relaxed and comfortable in a crate is something we recommend to all Italian Greyhound owners. A crate is the safest way to transport Italian Greyhounds in a car as a loose Italian Greyhound is at risk of serious injury if you were to have an accident. The safest place for your Italian Greyhound in a car is in a crate secured on the back seat. Most modern cars are designed so that the boot crumples on impact so we don’t recommend that you travel your dog in your car boot. Please note that we do not condone crating any dog for long periods of time. 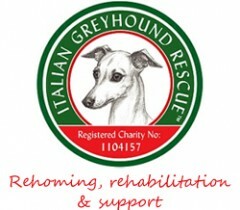 An Italian Greyhound needs to be trained to stay in a crate – it would not be fair to just put them into a crate, shut the door and expect them to like it. There are many good training books available that describe sensitive methods to crate train your dog, gradually building up the length of time spent in the crate without causing distress to your dog.